Cryptozoic Entertainment plans to release a set of collectible “meeples” based upon DC Comics characters, including Firestorm! Cryptozoic Entertainment are the folks who produce the excellent DC Comics Deck Building Game. Check out all the characters they plan to release as meeples (notice fourth row; fourth one in the row)! For those who don’t know what meeples are, they are wooden tokens traditionally used in board games to represent anything from a player’s character to resources used in the game. Meeples have become somewhat of a staple for gamers and meeple themed merchandise has become increasingly popular with the modern board game hobby boom. 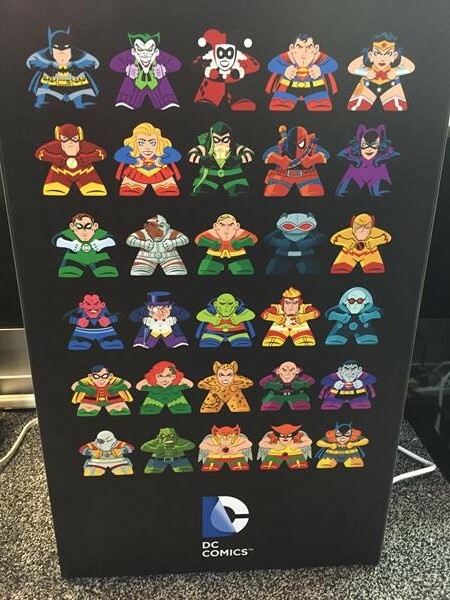 Mighty Meeples based on thirty different DC characters will be available in the third quarter of 2016 and available as blind packaged characters and in sets. Personally I think meeples are adorable, so I’m thrilled we’ll have a Firestorm meeple!! My thanks to Match-head Brandon Rouge for the heads-up! Those Hawkman and Hawkgirl meeples are fantastic! If only I could get a bunch of them for playing Carcassonne! @Luke… You will… this summer! Meeples mopple, but they don’t fall down.